LOMBOK ISLAND or PULAU LOMBOK in BAHASA – The New Paradise Island Of Eastern Indonesia, lies just 25 minutes by plane east of her celebrated sister island–Bali, Lombok Island offers a various charming unspoiled natural beauties that makes it often described as Bali in the past. Starting from the awesome volcano peak for hard trekking to the underwater sea world for diving or snorkeling, from the pristine white sandy beaches for sun bathing and swimming to the good breaks for world-class surfing, and from the scenic drive inland for day-trippers to the breathtaking hike for soft trekking. Lombok Island also has a range of fine handy crafts either wooden or earthen ones. They are crafted at exported quality and are sold at local negotiable price. Lombok’s sea breaded pearls are also getting more popular among tourists to bring home as valuable charms gift or souvenir. Aside from all of the aforementioned beauties, Lombok has unique colorful culture and traditions as well. We might say “ YOU MIGHT SEE BALI in LOMBOK but not LOMBOK in BALI”. Gandrung – a social dance about love and courtship – and stick fighting dances – trial of both magical and physical strength in one-to-one contest – for instance, are among the most popular tourist’s attractions often shown at big hotels in Senggigi or Kuta Lombok. However, some of Lombok’s cultural shows are often performed incidentally, if not regularly, to celebrate important days, for example the Independence Day and the province of West Nusa Tenggara anniversary, and those aforementioned are no exception. Traditional and locally recognized law (ADAT) is still an underlying path of life and common practice; predominantly the traditions related to birth, circumcision, courtship and marriage. Lombok has a various range of accommodation from the modest ones at very low rate for back packers to five stars rated hotel for those who are in search for more comfort and luxury. 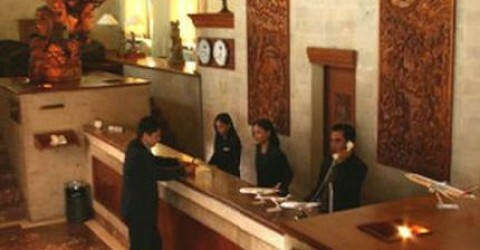 Most of the hotels are mainly based in Senggigi, the most developed tourism area in Lombok. Senggigi is situated just 20 minutes driving from the SELAPARANG LOMBOK airport. In addition, quite a few hotels set further north around Sire Beach, and many more selection based on the budget on the luring 3 Gili Islands. Drive on to South Lombok, Kuta Beach is now become more popular among investors and visitors following the first brick laying on the international airport nearby LOMBOK BARU INTERNATIONAL AIRPORT. There is a bunch of simple accommodation at very cheap price despite the slow moving development in the area. There are also a number of good air-conditioned hotels one of which is 4 star-rated international chains, Novotel Coralia Kuta South Lombok.